A tandem. It’s called a tandem bicycle. And I have never set bottom on one. My husband has, though, of course: my husband has done most things. He can add it to the experience of eating ice cream in Saddam Hussein’s crazy oversized palace, and learning to fire a Kalashnikov, and using confederate soldiers from some Sealed Knot-style dress up re-enactment company to demand money for charity from large inebriated crowds. And leaving an inflatable gorilla on the stairs when we went away, to frighten off burglars. Once upon a time when we were still young reporters, the office loudmouth had an idea. He was a loud person by nature: brash, rude, outrageous yet still, somehow, likeable. He eyed up the charity cycle ride which traversed three counties. And with his news brain rather than his commonsensical one, he settled on cycling the entire way for some charity or other. He needed a sidekick: someone to talk at along the way. A mate, because lone charity efforts are tedious and solitary, whereas if you’re together you have someone with you when you stop at some thatched country hostelry for a pint and a pie. He settled on Phil. The pair approached the thing with jovial humour. They cadged a charity tandem from the local worthy cycle seller, and turned up at the starting line with bluster. The weather had bluster, too. It was not a kind day. And a top cub reporter is not always the most tolerant of tandem partners. It is not a ride Phil remembers with affection. I remember seeing the photograph, taken by the office photographer and developed in our own dark room: Phil stationed at the back, looking glum. I am fortunate to have the low-down on a tandem ride without ever having ridden one: because my friend Jan, from Mainly Fair With A Chance Of Rain, gave it a full review. After that, she said: never again. She’s a seasoned cyclist, never happier than riding a bike. Her accounts so often leave one giggling: read hers here. The main problem, from what I can gather, is that while you are putting in all the hard graft of pedalling to get up hills, if you are sitting on the back seat, you can’t see a thing. All the rewards of a cycle ride are absent. The sense of being in control, the gorgeous views, the satisfaction of manipulating a machine so it is in tune with one’s wishes. Instead, the second set of handlebars has nothing- no brakes, no bell, not even the ability to steer. You are just a pair of useful legs. Added to which you can’t see what’s coming; and so are completely dependent on the driver at the front to shout warnings and other useful information. Not only is cycling at the back of a tandem tedious, it’s powerless. I feel a great big fat metaphor coming on. It won’t be a stylish marriage; I can’t afford a carriage. Now: Daisy. Before you consider this gentleman’s proposal, remember to ask: which seat will he be requiring? Because I’ll wager he’s not thinking of taking the back seat, with no view, and no earthly idea of where he is going. No: I’ll bet he’s thinking of driving, in which case you, with your pretty dress, will be stuck in that service role, pedalling for grim life. The pretty dress, Daisy: it won’t stay pretty for long. And you’ll be left in someone else’s shadow, pedalling just to stay on your seat. It’s called a tandem. And one person goes behind the other. Me, I prefer enjoying life alongside someone else: I leave the tandems to other people. Posted in Shrewsday MansionsTagged bycicle for two, Daisy, Dasy, tandem, tandem bicycleBookmark the permalink. Not for me, I’d be sure and make the front guy fall. There are more perspectives than there are bicycles on this globe, Elspeth 🙂 No need to change- I love your take on life! I’ve been doing some research into the bicycles made for 2, and there are definitely cases where the need for t least a view are catered for. I’m too much like you, I’d not be happy at the back with no power. Maybe a knitting needle affair that can poke the front rider would help? Sidey, I just knew you’d come up with an ingenious if Machiavellian solution 😀 Knitting needle it is! Grmupy Kate! We haven’t met you before. This was a fun read. Just be glad you’re not a Goodie. I know – there are some really long tandems too! Blame the grumps on the rain, Tilly. No Summer is not good for my humour. The very one! Brilliant stuff. Here’s to an hour that is about to be wasted looking up old PG Tips adverts. Have a dry weekend Kate! WP, you are clever. That’s perfect. Elbow room dependent, I’d happily cycle all round Berkshire on that with Phil at my side. I must alert Daisy. Hi Smidge 😀 An excellent point! Let us hope Daisy was as wise as you…. I’ll be humming this all day long now, Kate. Tom and I have, on occasion, looked at a tandem, hemmed and hawed and then said “nope”. His six foot four lean frame to my 5 foot three round one just don’t cut it, besides which he would not want me to steer, nor would he want me at his backside. Me? I’m with you. Something cool on the side of the road watching. Sounds perfect, Penny 🙂 Enjoy Daisy, Daisy…..
A fun way to put across a strong message.. 🙂 loved it. Is there a side by side tandem…? That may suit better! Have a look at Wonderingpilgrim’s recommendation . Perfect. Nobody likes a back seat driver. *looks round furtively* My idea of heaven – a back seat driver who can’t see enough to pass comment! Glad the gorilla got straightened out – I was having strange visions. We had a celebrated murderess in South Africa, Daisy De Melker, and the version which went round then was on the lines of ‘… if they catch you they’ll give you what is your due They’ll tie … And you’ll go plop, on a six foot drop, and then that is the end of you.’ She was, in fact, duly hanged. I reckon many of us immediately thought of the old song. . .I did too, but decided to put a personality spin on it. . . He was 1/2 crazy, you know! LOVED your story, Kate, as always! I’m with you, Kate – I want the experience of turning my bicycle into another appendage. One couple who tried tandem riding thought it would eliminate his always having to wait for her. The new set of issues encouraged her to give up cycling with him period! Our “summer” is so cold that the weatherpeople are beginning to name the cold fronts! 😀 It is all very sad, Amy. We cannot seem to find Summer and we’ve been waiting such a long time for it! Ooooh, look forward to reading that one, Jan! Thanks! You too! I don’t think I could hack a two-seater bike. I am too lazy to be up front and the back would bore me to tears. “Daisy, Daisy” is the extent of my knowledge about these contraptions. I think I’ve seen one on rare occasion, from a distance, but that’s it. Tandem biking, tandem kayaking – have done them both and neither is any fun at all. I’ll bear it in mind, BB 😀 I shan’t be getting on a tandem any time soon. A lovely Wikipedia passage about the song,composed in 1892, Debra: When Harry Dacre, an English popular composer, first came to the United States, he brought with him a bicycle, for which he was charged duty. 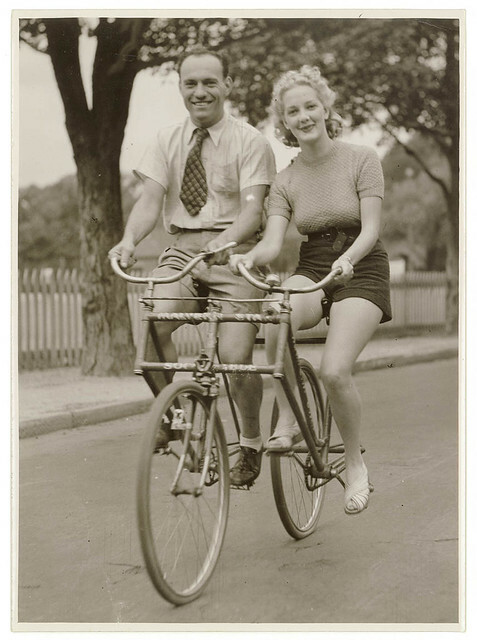 His friend (songwriter William Jerome) remarked lightly: ‘It’s lucky you didn’t bring a bicycle built for two, otherwise you’d have to pay double duty.’ Dacre was so taken with the phrase ‘bicycle built for two’ that he decided to use it in a song. That song, Daisy Bell, first became successful in a London music hall, in a performance by Katie Lawrence. Tony Pastor was the first one to sing it in the United States. Its success in America began when Jennie Lindsay brought down the house with it at the Atlantic Gardens on the Bowery early in 1892.